Boscobel Public Library: Leaves are Falling, Books are Calling! Leaves are Falling, Books are Calling! Fall Storytime for toddlers thru pre-k begins this week with "Nuts About Squirrels! ", and takes place every Wednesday morning from 10:30 to 11:00 am through December 5th. Children, families and friends will enjoy an entertaining, story reading and related activities including sing and dance-a-longs, coordinated play, crafts or activity sheets and books to take home related to each week's special theme. There is no charge for this program and all pre-k and younger children are invited to join us for reading fun, learning and meeting new friends. Our October 17th program theme will be "The Messys". We hope to see you then! Get Out and Vote! The midterm election takes place November 6th. The last day to register to vote, either online or by mail (postmark date) is October 17th. Voters can also register at their Municipal Clerks Office thru November 2nd, and, with proper ID, at their polling place the day of the election. Absentee ballots may be requested online at https://myvote.wi.gov. This website also provides more information about important deadlines, registration, access for voters with special needs and acceptable ID. To learn even more about the candidates, issues, how to register and Voter ID requirements, a voter information shelf has been set up at the library. Midterm elections fill important legislative seats at both the state and national levels. Everyone is encouraged to stop by, check on their voter registration status ahead of election day and to participate in this vital democratic process which is denied to so many others around the globe. Boscobel Library Local History Club meets the first Thursday of each month from 6:30 to 8:00 pm in the downstairs clubroom of the library. Next meeting will be November 1st. This new group is one of the fastest growing library programs and is for anyone interested in sharing and learning more about local Boscobel and surrounding communities' history. Each month a different history topic is discussed followed by "Show and Tell", with members bringing in all types of memorabilia and stories. At October's meeting, JoAnne Wedge described how Meller's Drugstore stocked the classroom books and other supplies needed in one room schoolhouses, Some recent items displayed included the first, 1904 edition of Sparks, the Boscobel High School year book; A copper bottle opener from the Boscobel Brewery; Images and family history from John Puckett and Sons Builders and block manufacturing; Promotional items such as Seemann Drugstore fans, a Mayme Contoit jewelry box, Parker-Hildebrand Co. crockery and many photos and documents of individuals, homes, businesses and places that are long gone but not forgotten, and which contain important details of community history and culture. The Library History Club is dedicated to sharing, capturing and documenting these memories of our community so that future generations will be able to encounter them through the library's newly established history archive. Club meetings are open to all. 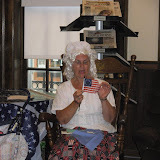 For more information or to volunteer, please contact the library at 608-375-5723 and visit our Boscobel Public Library History Club page on Facebook. Frieda's Readers Bookclub meets at the library the third Tuesday of each month at 7 pm, in the library reading room. Next meeting is October 16th, when the club will be discussing their scary October pick, Mystic River by Dennis LeHane. The club is open to all adult readers and visitors are welcome ! Copies of each month's title are available for checkout at the library. Come join in a lively discussion about books, literature and life in general. For information about these and other ongoing library programs and services, please contact the library at 608-375-5723.